Paul Fisher sees the world from behind glasses so thick he looks like a bug-eyed alien. But he’s not so blind that he can’t see there are some very unusual things about his family’s new home in Tangerine County, Florida. 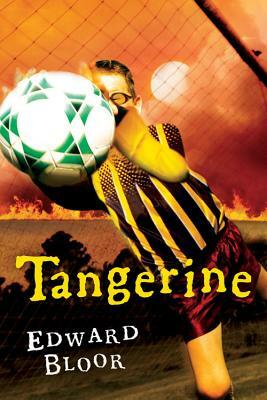 Where else does a sinkhole swallow the local school, fire burn underground for years, and lightning strike at the same time every day?The chaos is compounded by constant harassment from his football–star brother, and adjusting to life in Tangerine isn’t easy for Paul—until he joins the soccer team at his middle school. With the help of his new teammates, Paul begins to discover what lies beneath the surface of his strange new hometown. And he also gains the courage to face up to some secrets his family has been keeping from him for far too long.In Tangerine, it seems, anything is possible.